Chao Yu is a graduate of China’s prestigious Tsinghua University. In 1999, after the communist regime began its campaign against the Falun Gong spiritual practice, he assisted foreign correspondents to develop secure communication channels, evade the authorities, and conduct interviews with Falun Gong adherents who had suffered persecution. Because of his activities, Yu, his family, and friends have been given long sentences and spent years in jail. Liu Zhimei (1980–2015) was a Tsinghua student from an impoverished rural family. 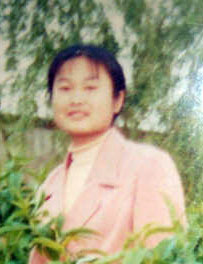 Her refusal to give up faith in Falun Gong ended in her suspicious death in a well after over a decade of imprisonment, torture and sexual abuse, and other mistreatment at the hands of the communist authorities. Deep sorrow rose in me when I learned about the miserable death of Liu Zhimei. Liu was studying Chemical Engineering at Tsinghua University when I met her at a Falun Dafa practice site on campus. She came from Laiyang to Beijing when she was recommended to Tsinghua University as the number 1 student in her whole province (so unlike all other students in China, because of her excellence she didn’t need to do the entrance exam). Liu was kicked out of Tsinghua University because of her faith in Falun Gong. Maintaining her belief meant suffering abuse, even physically, from her father and brother, as they too wanted her to give up her practice. At risk of being arrested in her hometown, she returned to friends and fellow Falun Gong practitioners in Beijing. Because police may check her bus, she walked the whole way, even crossing the Yellow River bridge by foot. She was just 21 at the time. She had no income, no place to live, and her career prospects had been ruined. I also lost my earlier job and couldn’t go back home because of the persecution against Falun Gong by the Chinese government. But fortunately I soon got a new job with an even higher salary. So I shared my apartment with Liu and covered her living expenses. I wanted to help her because we were fellow practitioners and shared the same faith. We lived in different rooms. I picked the room at the north which is cold and small, and offered her the room at the south which is bigger and warmer. I chose the hard bed and offered her the Simmons bed with a nice, soft mattress. The first few days in her new room, she said she was not comfortable with her new bed which was soft and luxurious, because she was used to a hard bed in her hometown. I insisted that she would soon get used to the nice bed. The winter was just beginning at that time and my apartment had a good heating system. The room warmed up with the reassuring sound of wall-mounted boilers, and white steam rose from the chimney outside the window. I felt relieved and grateful that we had a good place to get us through the cold winter. One time we were out in the car distributing leaflets that told the truth about Falun Gong and the persecution, until we both got hungry. I treated her to roast duck at a nearby restaurant. She finished the duck and the soup carefully and told me, “It is my first time eating roast duck.” With happiness mixed with a little sadness, I replied, “I will treat you to roast duck again in the future.” She had never been in a car before either (even less than 2 decades ago most Chinese didn’t have a car), so going out in the car with me was another first for her. I offered her 3000 RMB to study in a driving school, because I wanted her to have a skill so she could make a living. She said to me, “My nickname is Shuping and that is what my family calls me. You can just call me Shuping.” So I started to call her Shuping from then on. I was a careless man at that time and didn’t realize that she was treating me as a family member by sharing her nickname with me. It wasn’t until many years later when I recalled this scene in prison that it occurred to me. I had a lot of fake names to protect my identity at that time, so I wasn’t concerned about what she wanted to be called and I thought she just used this name to protect her identity as well. We did a lot of work together to help stop the persecution of Falun Gong. I bought a Japanese auto-printer so we could print anti-persecution flyers. I was in charge of looking for distribution channels and Liu was in charge of printing. We printed more than 700,000 double-sided anti-persecution flyers before transferring ownership of the printer. At that time, we were not sure about the best way to clear the name of Falun Gong. Liu always thought that it was a real regret to not go and publicly petition at Tiananmen Square, as so many other Falun Gong practitioners did to make their voices heard. She thought it was not enough to just do underground printing. I kept sharing with her that everyone has their own path and that she didn’t need to be the same as others. But I was not sure which was the best way myself either. So I worried that it might not be right to stop her from following the voice in her heart. One day she insisted on going out to petition publicly. I had to let her go though I had many worries and concerns. I heard no news about her for days. One day I came home from work when it was almost dark. I saw someone sitting on the stairs falling asleep in her own arms. I was shocked until I realized that it was Liu. I was so happy, and held her hands tightly for quite a while without a word. In fact my tears were about to fall at that moment. She told me happily that she had petitioned in public for her faith. She was put into a vehicle with other practitioners and driven away to somewhere far from Beijing until she was forced to get out of the vehicle. She walked back all the way by foot. During the time that we spent together, she wanted to do many similar public things despite the grave danger. One day she planned to clarify the truth by painting some positive words about Falun Gong; I stopped her by blocking the door with my arms when she was about to go out with brush and barrel. 15 years ago I was an unrefined man and didn’t how to be considerate or caring. I spent all my time working. I took double the workload to earn extra money, and spent the rest of my time doing anti-persecution work to expose the lies of government propaganda. We didn’t have a washing machine in our apartment. I asked Liu to cook and wash winter clothes for me (to save time). She cooked for a while but refused to wash clothes for me. There was no self-service laundry place in Beijing back then and it was too expensive for me to use a professional washing company. So I had to ask someone else to wash the clothes for me. I didn’t realize that Liu didn’t know how to wash winter clothes. Growing up she had to spend all her time and energy on her studies, so she could escape her poor background and change her fate. She didn’t even have the skills to take care of herself. Looking back on the old days, I didn’t take care of Liu like a brother even though I was 7 years older than her. I found my faith earlier than her, but I didn’t manage to give her the wisdom or clarity to understand more deeply about anti-persecution work – otherwise she might have been more capable of protecting herself. She was arrested earlier than me. I was arrested more than 1 year after her. Liu was arrested at our apartment because of the printing. I heard that when the police dragged her out in her slippers, she kept shaking her head as ‘no’ when the police wanted her to confirm the location of the apartment. It is well known that the police try to break your spirit by forcing you to give details that incriminate others. Liu refused to do this, and courageously did her best to protect me. When I was released after 10 years in prison, I learned that Liu had been tortured severely – she lost many of her fingernails during torture in Beijing Police Bureau. Liu was also sexual abused, gang raped, suffered forced abortion, and was finally driven to mental disorder by nerve-damaging injections. My heart was like being stabbed by a knife. After I got abroad, I tried hard to settle down as soon as possible so I would be able to get her out of China and join me in the U.S. After I conquered all of the difficulties and got my first job, just two weeks later I learnt about her tragic death. My heart was stabbed by a knife again. I wanted to help but I couldn’t; this pain remains deep in my heart. Liu Zhimei, gentle as willow with a strong will like plum blossom (this is what her name means), will always be the simple, pure, and kind-hearted girl in my heart. I will never forget about her.